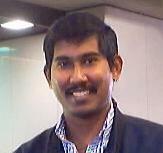 Bio Jesudas Chinnathampi also known as Das, is working with Active Server Pages since 1998. Das started working with ASP .NET since the first Beta. Das has written a chapter for two WROX books which talks about working with ASP .NET and databases. You can view the details of his book at the following links: co-author - ASP.NET Developer's Cookbook http://www.amazon.com/exec/obidos/asin/0672325241 co-author - Beginning ASP.NET Databases using VB.NET http://www.amazon.com/exec/obidos/ASIN/1861006195 co-author - Beginning ASP.NET Databases using C# http://www.amazon.com/exec/obidos/ASIN/1861007418 Das has also published some interesting articles at http://www.asptoday.com such as: DrillDowns in DataGrid http://asptoday.com/content.asp?id=1986 Moving from RDS to SOAP http://asptoday.com/content.asp?id=1935 Das has a Masters Degree in Computer Application. During leisures, he enjoys browsing and spending time with his family. 17 Oct 2003 How to Read a text file in ASP .NET ? 22 Oct 2003 How to Create a text file in ASP .NET ? 17 Oct 2003 How to Send Email from ASP .NET ? 10 May 2002 How to capture the Double Click event in a DataGrid?